This may be the truest form of a teaser I've seen in a long while. 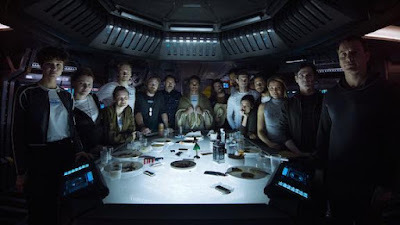 From director Ridley Scott's ALIEN: COVENANT, this clip titled Last Supper introduces the ensemble cast (including Jussie Smollett, Billy Crudup, James Franco, Danny McBride, Carmen Ejogo, Michael Fassbender, and Demián Bichir) and leads us to believe that something scary will likely happen. Spoiler alert: nothing does. In fact, you can almost hear the clip laughing at you. And what's more disappointing is that it rips off a scene from the original film, in which something hella scary does actually happen. ALIEN: COVENANT opens in theaters May 19.